Beautiful British Columbia. We really have it all in the westernmost province of Canada. Take our gorgeous and endless coastline for example. If only could find a way to bottle that Pacific Ocean breeze! Coastal living is at its best on the Gulf Islands in Georgia Strait or the Salish Sea, as it's now called. That’s where we’re heading today to show you this exciting project. 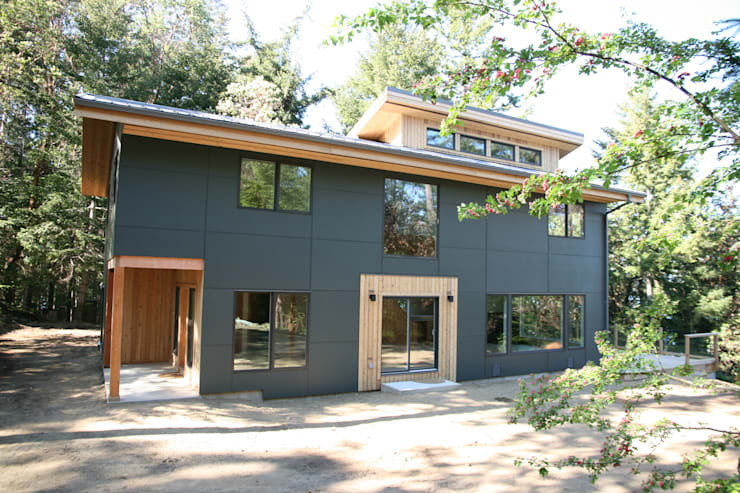 This custom-designed home, built on Salt Spring Island, has a sleek modern look with cedar wood accents. Architects at Linwood Homes created a striking home for their clients that suits the West Coast lifestyle. It’s a home that reflects and complements the natural beauty of British Columbia. The home sits amongst the idyllic seaside woods. The greenery is lush and profound. Who needs landscaping when mother nature already did such a great job? Cedar accents help home to blend with the natural surroundings. On the exterior, the home has dark grey smooth fibre cement panels with matching metal trim. The siding contrasts nicely with the cedar and has an elegant modern look. A view from the side shows off the sloped roof and an open terrace. The home has plenty of triple glazed windows to bring natural light into the home and frame the ocean views. Upstairs, one of the bedrooms has a private balcony overlooking the terrace. We love the terrace because on those rare occasions where it’s not raining on the South Coast, the patio weather is just perfect. This home has the potential to develop its outdoor space! Let’s wrap up our tour with a peek inside the home. Modern style home with fir beams. The home makes use of its 2,400 sq ft space by putting 3 bedrooms upstairs and keeping an open plain interior on the main floor. 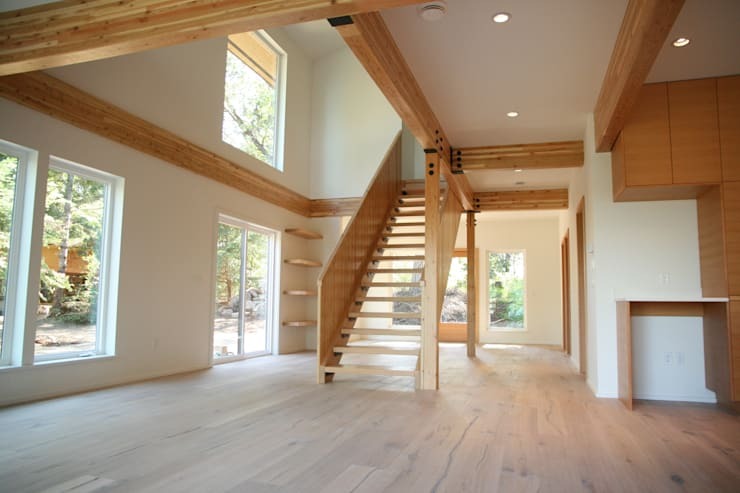 Fir support beams highlight the space and the wood floors look pearly and soft. The stairs are cleverly designed to have a light as air feel. Looking outside the many windows and seeing trees keeps you connected with nature. 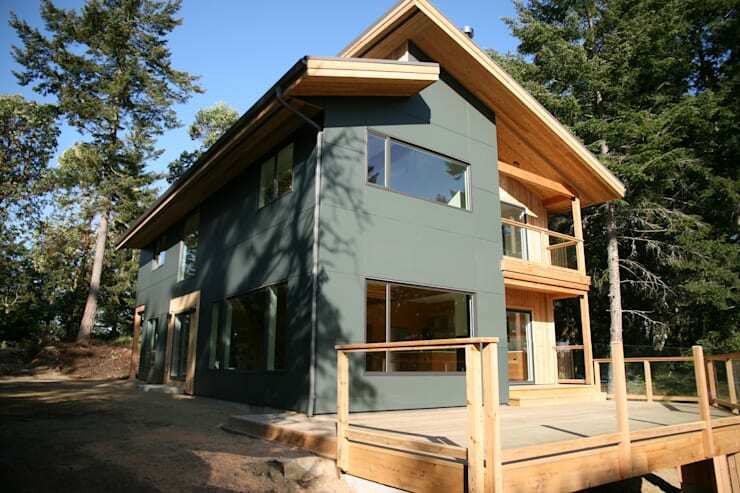 Thanks for joining us on our tour of this modern home in the Gulf Islands! For more Canadian inspiration, check out our feature on 5 fantastic Canadian homes. What do you think of the cedar accents?